From one of the biggest names in Champagne, this stunning pale pink rosé is all elegance and joy. Fragrant red berries, cherries, delicate floral and backed bread scents skip toward the light palate of strawberry and earthy flavours. Creaminess and fruity acidity bring about a bright, tight and intense finish. Makes a delicious accompaniment to scallops, soft cheeses and desserts with a red fruit base. It is very definitely a Pinot Noir year, exceptionally well-suited to laying down. Sampled with scallops, this wine affirms its food friendliness. Over time, it will also prove wonderful with more substantial dishes including salmon, guinea fowl and pheasant as well as soft cheeses such as Chaource and Brillat-Savarin; or with desserts based on red fruits such as red fruit zabaglione or gratin. 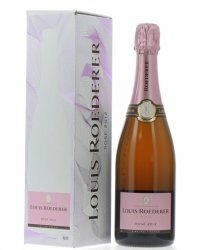 A great Rose Champagne requires very ripe grapes which is not always easy to achieve in Champagne which is why Louis Roederer decided to invest in one of the most precocious vineyards in Champagne, Cumieres in the Vallee de la Marne. There the light of the steep, south-facing clay and limestone slopes is accentuated by the proximity of the Marne River, producing high levels of phenolic maturity. In the development of its rose Champagnes, Louis Roederer employs the saignee method with fermentation following a cold maceration on skins which can last from 5 to 8 days. 20% of the wines are vinified in oak barrels with weekly batonnage. There is no malo-fermentation.The vintage Rose is matured for 4 years in the cellar with a further six months rest following disgorgement. The dosage of between 8 - 10gms is adapted slightly for each vintage.